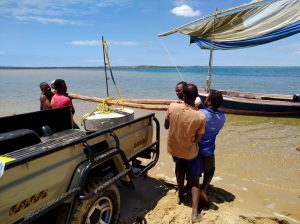 Since the summer of 2017, volunteer expedition program Underwater Africa (UWAF) has been partnering with the OTN for a shark tracking project in the country’s Inhambane Estuary. The organization’s focus ranges from tracking aquatic species to studying the effects of microplastics on the marine environment. 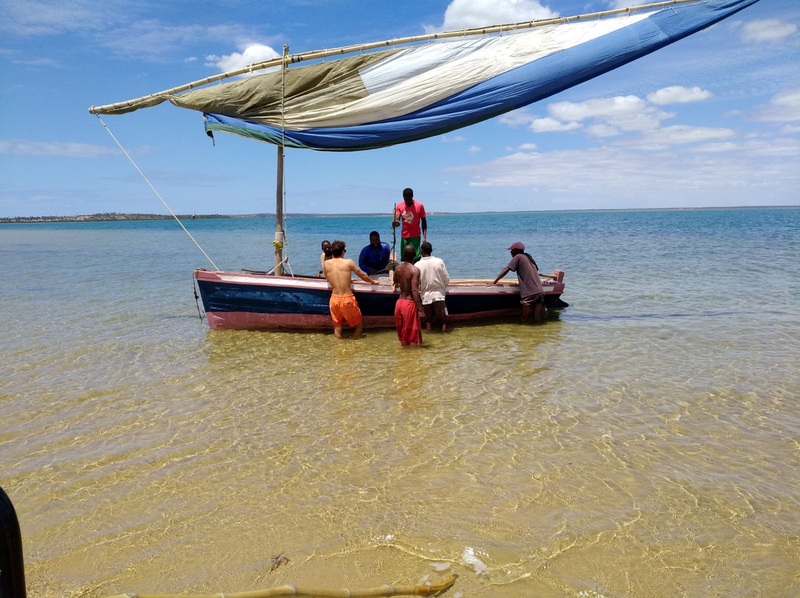 With the help of local community members, Underwater Africa’s scientific director, Calum Murie, has been deploying stations in the Inhambane Estuary monitoring shark movements in areas where human-shark interactions are high. After a number of fatal attacks over the last two years, Inhambane’s provincial government issued a shark cull in an attempt to minimize the risk sharks pose to humans in the area. Galvanized by a lack of baseline data on the area’s shark population, in combination with the threat of overfishing, the UWAF shark tracking project aims to provide information on shark movement and behaviour and ultimately reduce harmful human-shark interactions. Since the launch of the project, Murie and team have deployed ten receivers to complete the estuary’s tracking array. Mixing concrete, setting reinforcements and using buoyant materials to keep the receivers upright on the ocean floor, the team has been creative in using materials to help in the construction of the arrays. 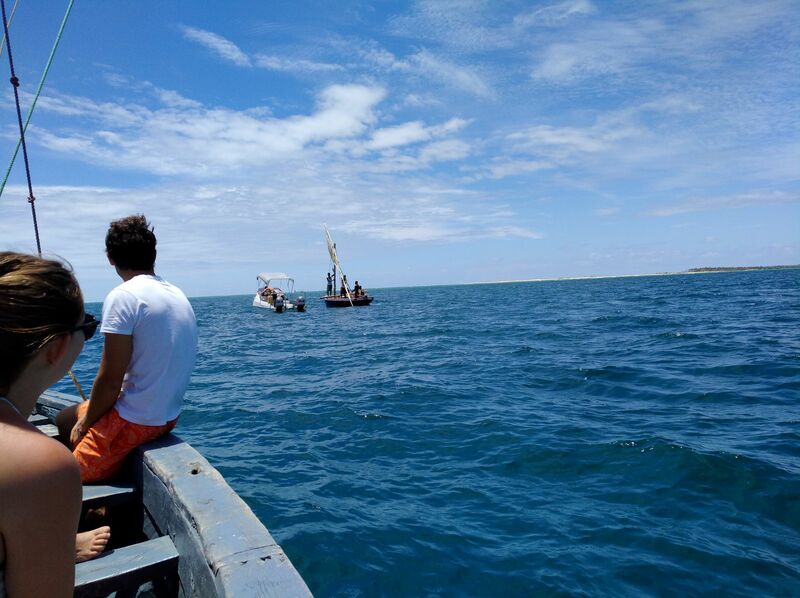 The UW Africa team frequents the Inhambane Estuary, relying on their dhow boat for expeditions. The dhow – a small, traditional fishing vessel, is the primary mode of transport for deployments in Inhambane. Stable enough to hold 100 kg concrete blocks attached to subsurface buoys, the modest and mighty boat is essential for field operations. The ocean can be unpredictable, and at times, unforgiving. Navigating variable tides and currents, poor visibility and blooms of jellyfish can all contribute to the difficulty of field work. However, the wealth of knowledge held by local fishers greatly aids organizations like UWAF in conducting scientific research. Team members provide local knowledge of the estuary, helping UWAF identify sections on the seafloor where the sand doesn’t shift and fishing activity is minimal, enabling them to safely and effectively deploy receivers. 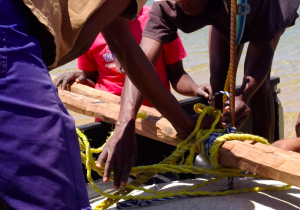 Additionally, utilizing local knowledge on known shark feeding grounds, the team has refined their fishing methods to more accurately target areas for shark tagging expeditions. The team’s collaboration with various members of the local community, (Casa Barry Lodge, Castello de Mar Lodge and others who have joined the team throughout the years), have all been integral in contributing to the success of the project. The support of the local community is significant to UWAF’s work in the Inhambane region. In turn, UWAF is working with local communities to protect nursery areas and promote the survival of young species with the aim of regenerating community fisheries. The project involves working with communities and the provincial government to educate people on the value of telemetry studies in collecting baseline data on shark populations and advising on protective measures for the species. They have six protected areas currently operated by the local communities and coastal police, who are trained at the UWAF headquarters. Four of these protected areas are in a vital shark nursery habitat. So far, the team has constructed two farms, which are utilized as training centres for community members. “We have involved the most vulnerable individuals from the communities, and these are women who have lost their husbands. The women will learn how to farm and then hopefully we can provide them with the funds to construct their own fish farm,” said Calum. Stay tuned for more Underwater Africa updates in 2018! For more information on the Underwater Africa Mozambique project, check out the first article on the project, as well as UWAF’s blog and website.